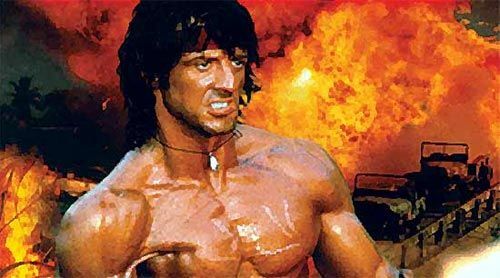 Sylvester Stallone is inspirational in many ways: Body builder, writer, actor, painter, entrepreneur and more and against insurmountable odds. 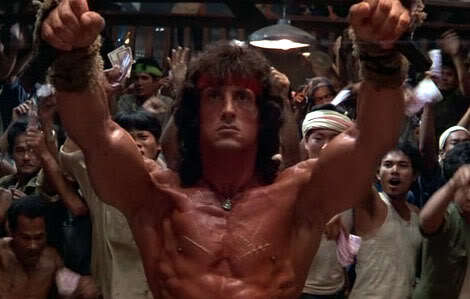 He encapsulates the spirit of never giving up on your goals in every way. 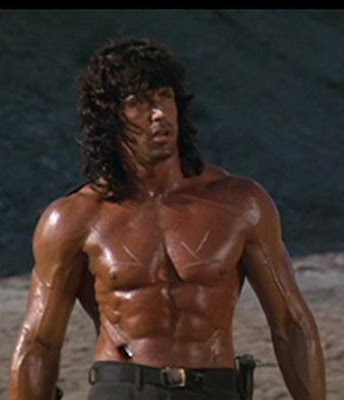 As Sylvester Stallone says: ‘It ain’t how hard you can hit, it’s how hard you can get hit and keep moving forward!’ How did Stallone get into this shape though? 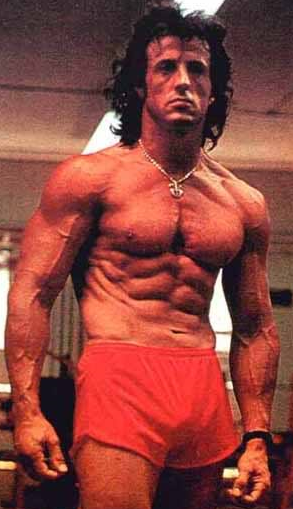 Grow Muscle Grow! 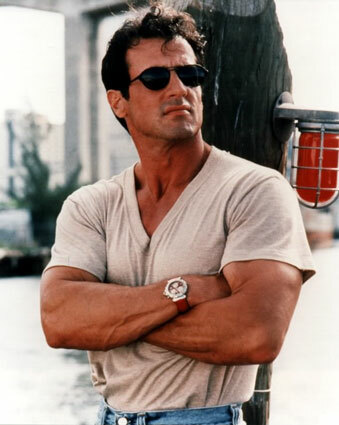 Sylvester Stallone has always maintained a low 4-7% body fat while weighing up to a chiseled 200 pounds for all his action movies. 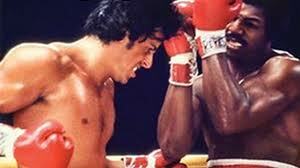 The Rocky Balboa muscular body-movie-star’s diet plan is a high-protein diet plan. 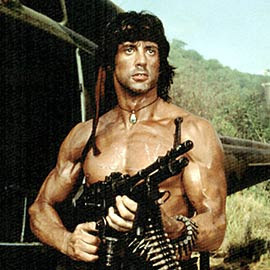 Sylvester Stallone is also the most disciplined man that you’ll ever meet in any walk of life. 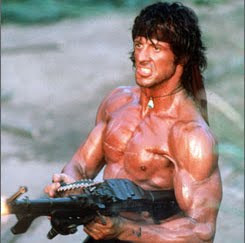 Sylvester Stallone follows a really disciplined diet plan. 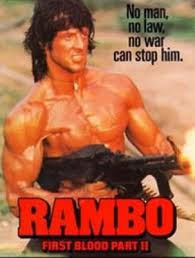 He doesn’t eat real late, doesn’t snack, and doesn’t eat much. 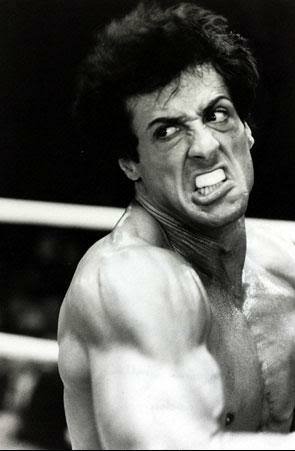 Sylvester Stallone sometimes includes pasta in his diet plan but only when it’s made with a special flour. 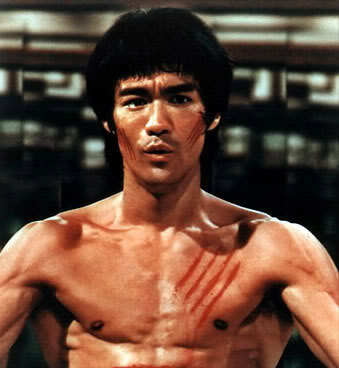 Fish and brown rice are diet plan staples for his perfect body. 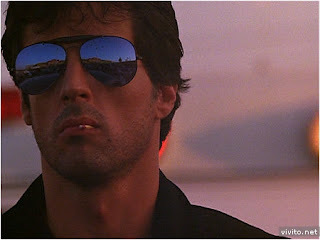 He drinks little alcohol, but occasionally enjoys champagne. 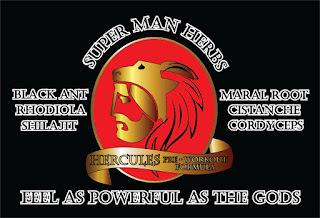 For extra energy he eats oatmeal cookies without process sugar or preservatives. 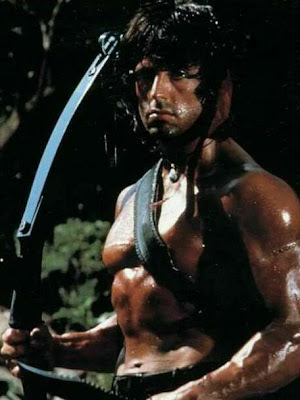 He hasn’t always been on a healthy weight loss diet plan. 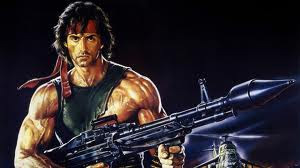 Sylvester Stallone used to be on an extreme weight loss diet plan where in at that time he just ate weight loss foods like 10 egg whites, a burned piece of toast and a piece of fruit every third day. 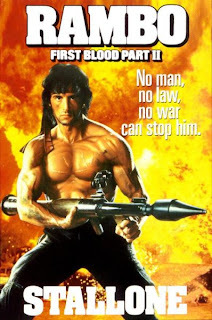 Definitely not an advisable diet plan. 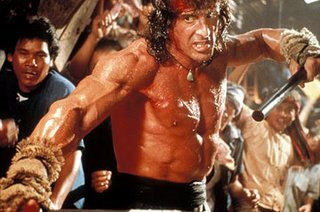 This kind of unhealthy weight loss diet plan provided the actor with no-where near enough energy, vitamins, minerals, or even protein, and Sylvester Stallone reports feeling ‘dizzy’ as a result. 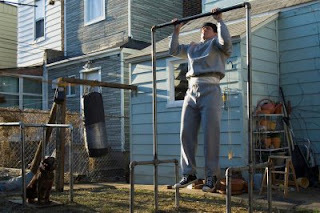 Angled Weighted Pull-Up Exercise (3-4 sets, 6-12 reps). 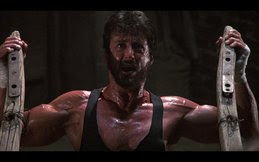 After a warm-up set with his body weight, Sylvester Stallone wears a weighted vest; he alternates pulling his chin first toward his right hand, then his left. 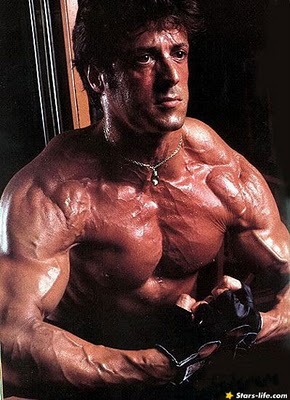 Unilateral Low-Cable Row Exercise (3-4 sets, 14-16 reps) Sylvester Stallone uses a special exercise equipment with two weight stacks side-by-side and holds a D-handle in each hand. 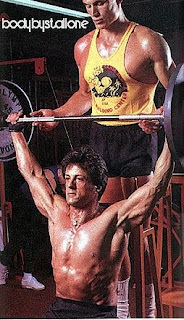 Plate-Loaded Machine Shrug (3 sets, 6-12 reps) Sylvester Stallone works up to 400-plus pounds. 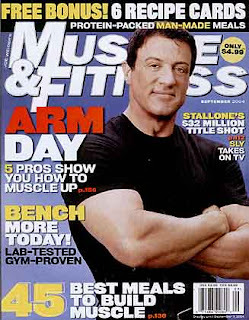 T-Bar Row Exercise Equipment biceps/back (3 sets, 10-12 reps) Done with one end of a barbell placed in a corner, Sylvester Stallone reps one arm at a time. 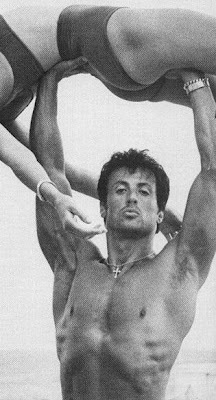 Squat-Jump Pull-Up Exercise (3 sets, 8 reps) Using a pull-up bar exercise equipment that’s at least 8 feet high, Sylvester Stallone does body weight squat exercises, jumping from the floor on the upward push and grasping the bar. 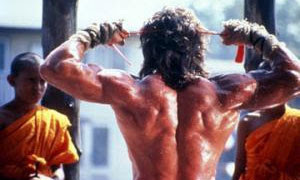 This is how Stallone gets his wide back lots of pull ups. 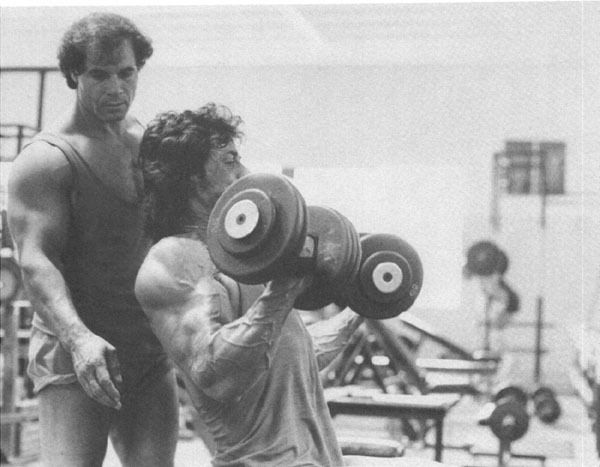 Stallone with his trainer Mr. Olympia Franco Colombu, developing his muscular body with seated dumbell curls, for biceps, forearms muscles. 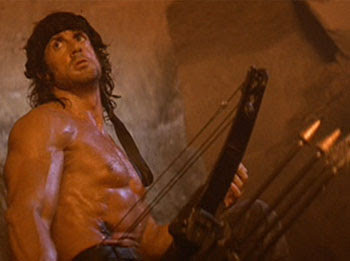 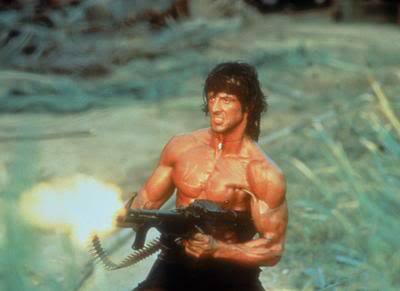 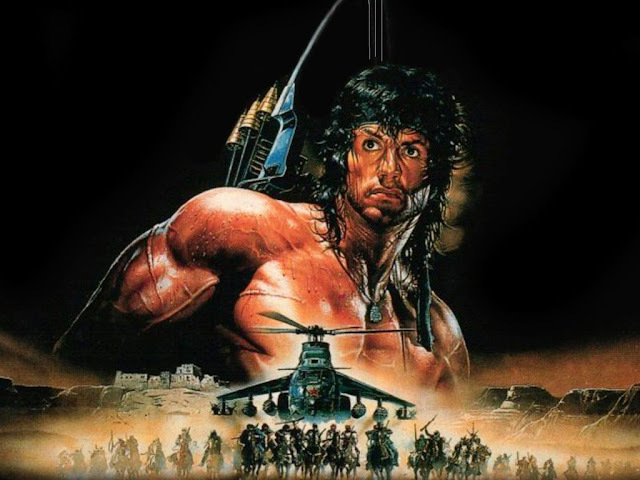 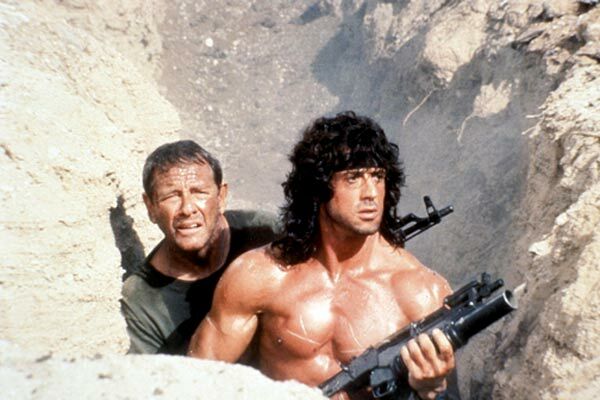 Scene from RAMBO-3, stick fight, shows Stallone's muscular back and shoulders. 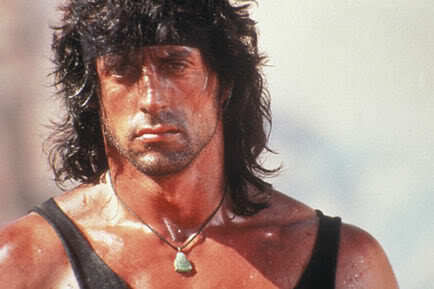 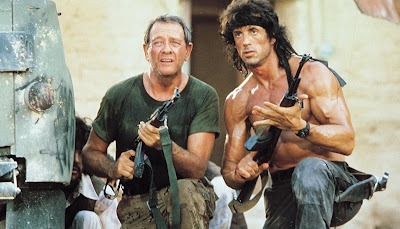 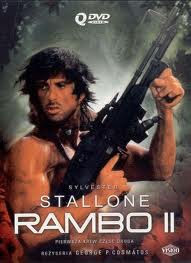 RAMBO 3 stick fighting again! 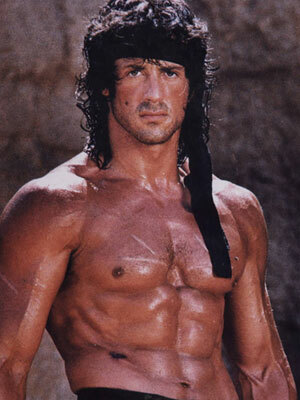 Sylvester Stallone's famous Rocky abs can be created with proper diet and weight training. 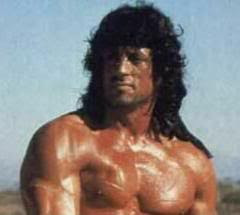 Sylvester Stallone's workout plan is definitely PAYING OFF!!! 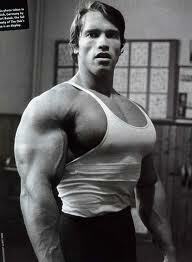 Superior chest workout routine : Bench press, incline bench press, dumbell fly's. 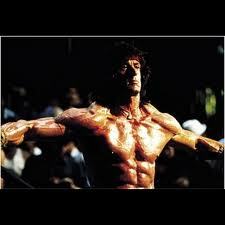 Superior muscle definition in the chest and shoulders, results of many bench and shoulder press. 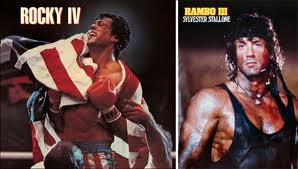 For Stallone's back pull ups, chin ups are part of his workout plan, after a pull up he drops back to the floor into another squat exercise and continues for reps.
Uneven Standing Barbell Curl (3 sets, 8-12 reps) Sly holds the barbell exercise equipment with one hand in the center, one nearer one side, so one arm is taking on more of the load. 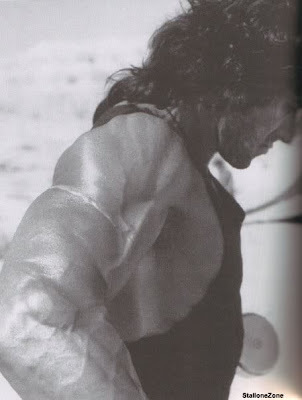 To work each side evenly, he switches grip position mid-set. 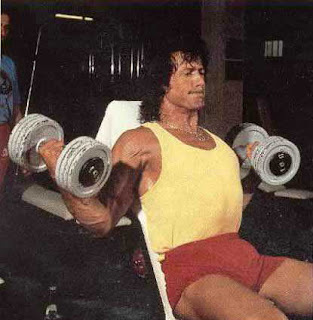 Strive Curl Exercise Equipment (3 sets, 12-18 reps per set) Sly adjusts the “Strive” cam three times per set for different stimuli on his bi’s, completing 4-6 reps per setting. 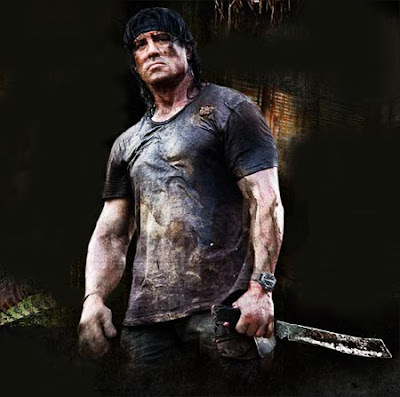 Dumbbell Hammer Curl (3 sets, 18-30 reps) Sly starts by lifting both dumbbells for 8-10 reps, then finishes with rapid, alternating reps for 10-20 more. 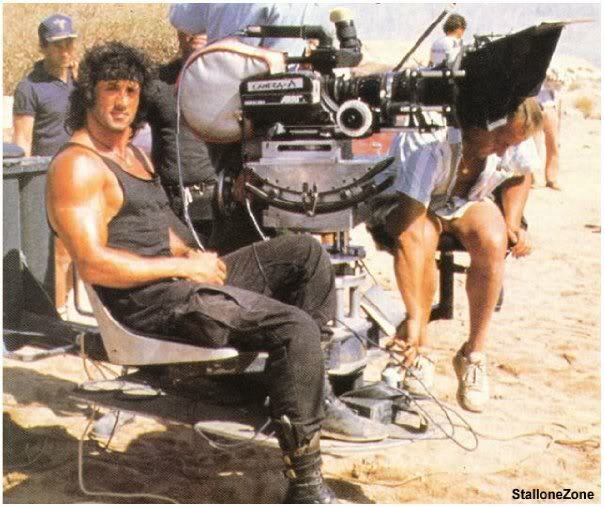 Standing Calf-Machine Shrug (3 sets, 6-12 reps) With feet planted and body rigid, Sylvester Stallone shrugs to raise the shoulder pads. 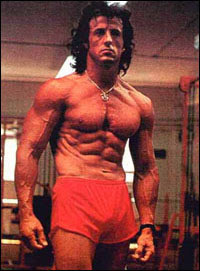 Sylvester Stallone also does weighted ab training between his fitness exercises and finishes with forearm move exercises. 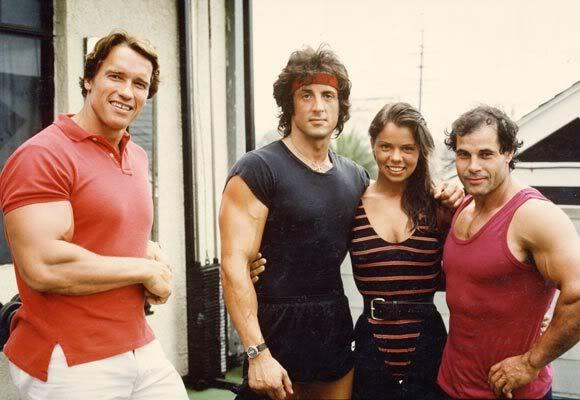 Mr. Olympia Franco Columbu trains Sylvester Stallone with the best workout plan ever!! 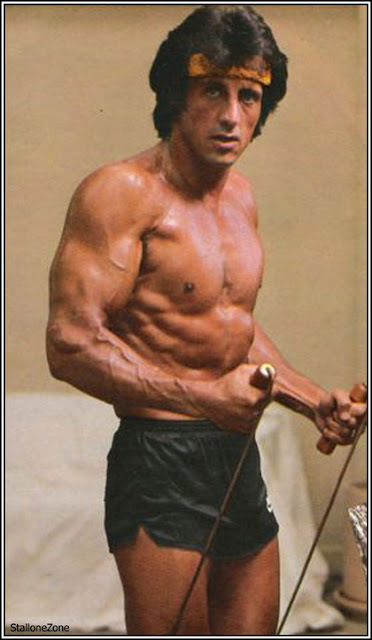 This is how Stallone gets his abs and surrounding musculature above movement was called "The Flag" by Bruce Lee. 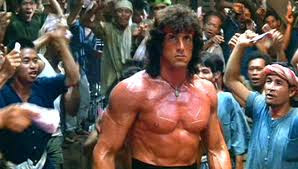 Stallone has dubbed them "Dragon-Flyes" If you will notice the ab section of Bruce Lee and Stallone are very similar. 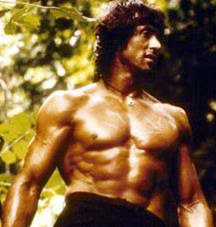 See the following video demonstration of the Dragon-Fly ab exercise flawlessly executed by Sylvester in Rocky-4, and in his own gym 2011 at 65 years young! 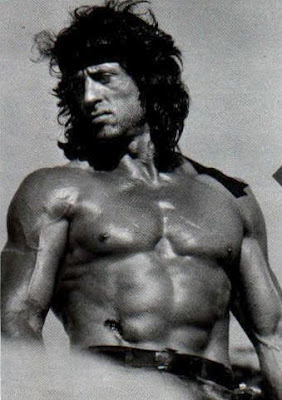 For complete muscular development Stallone used a Full Body Muscle Building Workout. 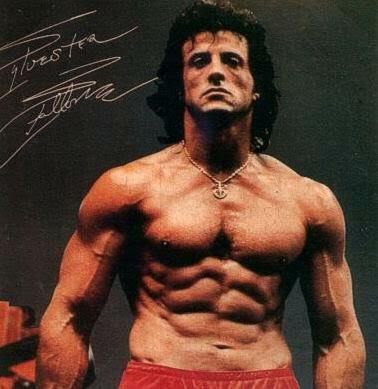 May you achieve the same results as Sylvester Stallone!